After all the hype, I just had to try it myself. Maid is on day-off, so it's a lazy take-out/delivery Sunday for us. The world is not fair. We do not deserve a third world version of the sandwich! Does anybody agree with me on this??? 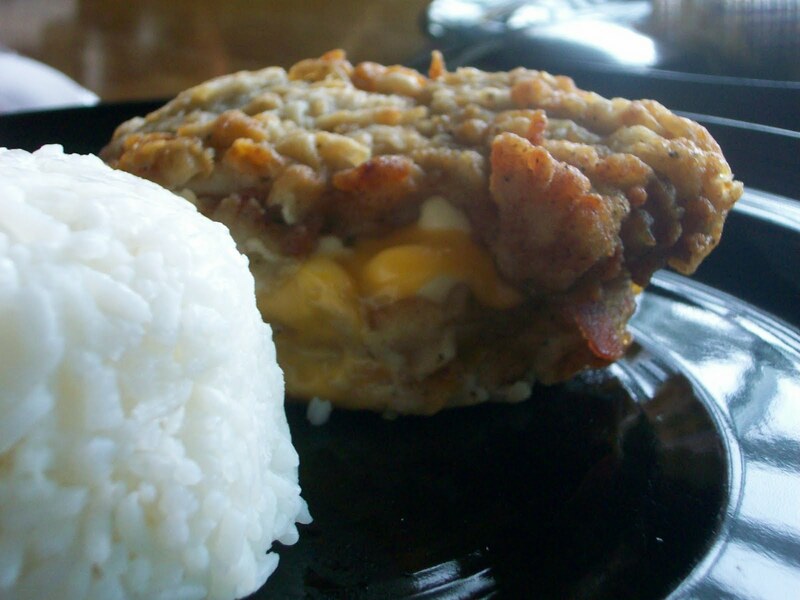 "The new KFC double down sandwich is real! This one of a kind sandwich features two thick and juicy boneless white meat chicken filets (yes, they spelled filets with one L! how can you miss that??? ), two pieces of bacon, two melted slices of Monterey Jack and pepper jack cheese and colonel's sauce. This product is so meaty there's no room for a bun!" First of all, I don't get to choose between the healthy grilled option and the artery clogging original recipe. Ok, acceptable. 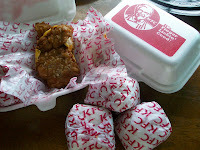 As far as I know, KFC Manila hasn't gone down the grilled, healthy eating path yet. And I ordered a double down for godsakes! Health issues are the least of my problems. Second, third and last: I did not get two pieces of bacon! (this makes me angry) I only got one, and it was NOT crispy. There was nothing reminiscent of sliced monterey jack cheddar, much less pepper jack cheese. And the colonel's sauce was mayonnaise. I ordered three sandwiches and they were all different sizes. One was about the size of a digicam (slightly bigger), and the other two were slightly bigger than an average smartphone. Our double down sandwich is NOT the real double down sandwich but a mere shadow of what it is supposed to represent. Having said that, it's still good and worth your P100. The sandwich is a bit blah in the beginning. The good stuff starts about mid-center. That's when you get all the gooey cheese (like the cheese of Mcdonald's cheeseburger but very deformed), mayo (which I'm not a big fan of) and your one pathetic slice of third world bacon. The one piece you have to savor through out the sandwich. It's good but very rich and oily. I agree with most people who say it's better eaten with rice. The rice somewhat neutralizes all the grease and breading. The chicken fillets taste like KFC chicken without the bones and gravy. We had our's delivered so it was quite soggy when it arrived. I still prefer the good old KFC original recipe fried chicken with all the fixings. The double down simply felt too much like junk food for lunch. I recommend you try it cause it's a heavy meal for just P100, however just don't expect too much like I did or you'll be left disappointed. For me, the baconator is still the fast food king when it comes to exploiting bacon in a sandwich!